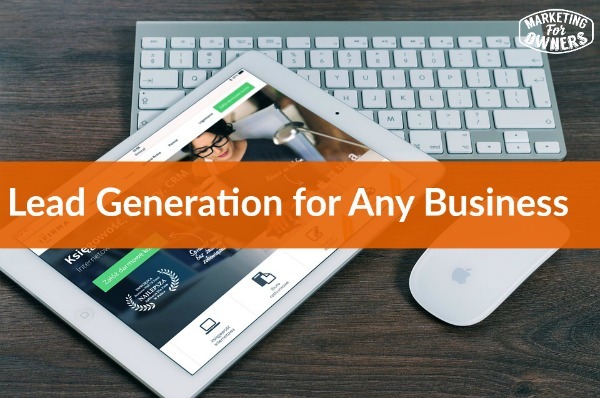 Lead generation works for every single business; I don’t care what you do, what your story is, lead generation will work for you, but only if it is managed and systemized. How many times have you been to an exhibition or some event where people display their stuff and you’ve gone over, you’ve spoken to them, you’ve talked about everything, you’ve thought, oh, that’s good, they have been busy all day and so on, and you have a good old chat. You walk away with the leaflet and one week, two weeks later after the event, you haven’t heard a thing. Unbelievable. Because they have no lead generation system and no incentive, no interest from the people, it’s just not there, or they lose the card. If you ring them up, I find it really annoying to have to contact people so they can sell their wares for me, that I have to make the effort. But when you ring them up, they always have the excuse, oh yeah, we lost, some were misplaced, or, we were so busy we haven’t got around to everyone. Yeah, sure, what a problem, what a complete…ugh! Talk about complacency. What problem do they think they’ve got? That they’ve got so many inquiries they can just ignore a whole load of them? And I can think of one particular case where I specifically went to the exhibition to see them, to see the product because we wanted to add it to Fire Protection Online. We used someone else’s product now because I went to see the company, they didn’t follow up, I spent a good hour with them, told them exactly everything I needed and wanted and… nothing. And recently, it’s coming up for the annual exhibition of this, recently they e-mailed me to say it would be great to see me back on the stand, which was so funny, because I am not going. And the funny thing is, so they can e-mail me to invite me back to the stand, but not to follow up. Let me explain. A lead generation system is where you proactively encourage people to give you their details in some way and then you follow up. So they become a lead, people who are potentially interested in your products, they then become a lead and then you follow up and you convert them into a customer and that requires a system. But the lead generation requires a system in the first place, so no matter what you are, firstly, to get someone’s details, you have to give them something in exchange, this is in our seven P’s what we call “permission”. So we describe this generally as a lead magnet. It can be anything, it can be a CD, it can be a report, a checklist, a survey, an audit, anything. If you are a cleaner or something, it can be a free room of cleaning, a free sample of your work, it can be a download, it can be a free course. For example, if you go to freemarketingcourse.co, that’s mine and that is where I show you this whole thing in twelve days, all for free. That is a lead generation system, go see how it works. And you will get the gist. Sign up there, see it, it’s actually quite helpful as well, very popular, by the way, thanks for all the comments, thank you, I like you. But, see how it works. So you get someone to give you their details, so if you’re not online, you don’t have to have a website for this. Someone can come into your shop, you can go onto a stand. If you have never been into the thing enter into a draw, put your business card in the big fish bowl or something so you can enter into the prize draw. In theory, they should take your details and add that to a database and then contact you afterwards, that is a lead generation. So you can do that, you can give away a prize to your potential clients, everyone you visit, anyone who you come cross. So if you are at a networking event and people say “Who are you?” Or whatever, give them your card would have something on the back or give them, tell them to go to a website or something, to a URL where they can sign up for something. Or if you say “If you give me your card, I can enter you into a competition, or I can contact you.” Etc. Get their details. That’s step one. The next thing is the way you follow up. So as soon as humanly possible, before they’ve forgotten who you are, if they forget, then they’ll be annoyed when you contact them because they can’t remember why you’re contacting them; as soon as possible. Phone them up or write to them or send them something, just communicate with them and so they think, oh. If you post them anything, send them a little gift, send them something for free, send them a sample, send them anything, send them a brochure if you have to, send them a little report, a checklist, some list of your favorite tools that you use to do what you do, something like that; a CD, DVD, a book that you recommend. I mean if you are in an accountant or something like that and you’re trying to advise and help your clients, you charge quite a lot, why not buy a book like say The E-Myth, something that will help them with their business and send it to them? It’s only going to cost you five quid or something under ten bucks. That’s good lead generation, that’s appreciated. And then afterwards, follow up and check that they got it. And then, during the sequence, this could be a few days later, this could be a week later, invite them to something. Make them some kind of extra offer that is not trying to get a sale, but that invites them to either come to an online webinar, or that you can go to them and meet them up to give them a free survey, free audit, something like that, so that you can follow up. Or, if you are that accountant, invite them out for a cup of coffee, treat them to a cup of coffee, go to take them out of their environment, tell them, let’s meet up in Starbucks and go and talk to them about their business, give them some kind of review, anything. And then after that, follow that up a few days later. So you might have a sequence where once you’ve got the lead, you follow up one day later, three days, seven days after that, five days after that, seven days after that and build that out, make that a standard, decide what you’re going to do and do it. This is where you build trust because people are not going to buy from you straightaway, they do not know who you are. And if you try to sell to them straightaway, you’re going to put them off. Straightaway the barriers are up, you’re done. This is a long-term game, so make sure you’re going to communicate with them, five, six, seven, eight times, because that’s what it’s going to take before they start to trust you and before they mean buy. And when you try to make that first sale, make it small, convert them from a lead into a purchaser, another one of our Ps. Convert them into a purchaser. Once you’ve got them to make that first purchase, you can then work on them to get a repeat purchase and build up from there. But that is what you need, you need a lead generation system, okay? And it works for anything, whether you are a landscape gardener, a hairdresser, a leisure club, a golfer, a fire extinguisher supplier, anything at all. I guarantee. Okay, book for the week. Today, this is a good one, one of my favorite authors is a guy called Joe Pulizzi. He wrote Epic Content Marketing, which is a book that anyone in my marketing department has to have a copy of that. Don’t worry, I give it to them, they have to read it and we have spare copies in the office for anyone who wants them. It’s fantastic. 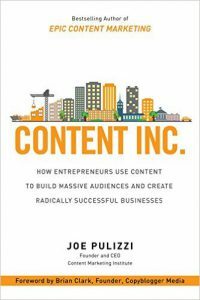 But he has written another book called Content Inc. Now Joe, whose business is Content Marketing Institute, you can read everything he’s got, it’s just a wealth of information. 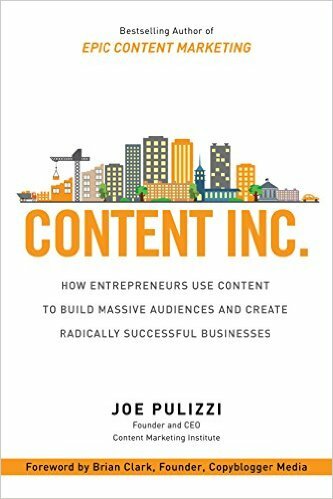 Joe actually coined the term “Content marketing”, he invented it. So he’s a pretty good guy when it comes to it, he’s been around a long time; he’s built a fantastic eight figure business from zero and this is how he explains to do it. If you want to get this for free, with no hassle, you can have it on me, I will send it to you wherever you are in the world. Go to marketingforowners.com/freebook, you can pick that one in your selection. Go there, see what you need to do to get it, it’s dead easy and I will pay for the book from Amazon and I would pay for the postage anywhere in the world. Go see what it is. I’ll be back tomorrow.